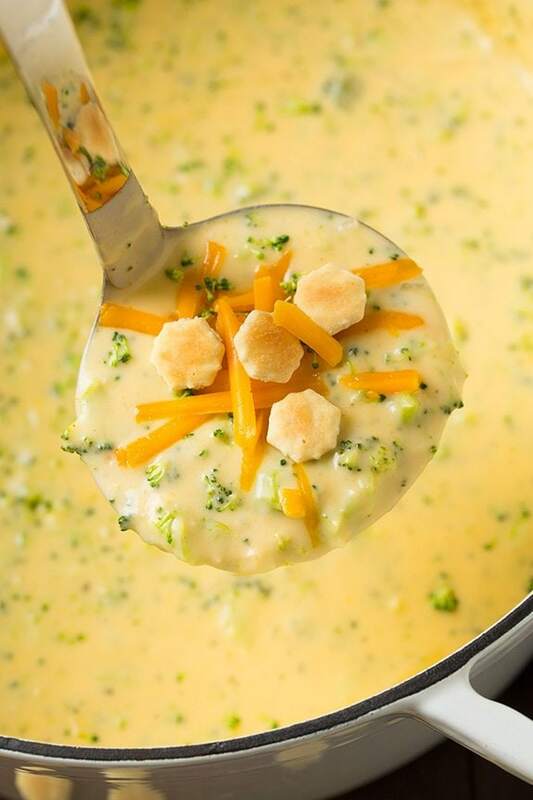 Broccoli Cheese Soup is the perfect comforting dinner to make on a cold day! This soup will always be one of my favorites. It’s perfectly cheesy, it’s rich and creamy, and it’s just oh so delicious! This is one of my go-to recipes, and I love how quickly it comes together. 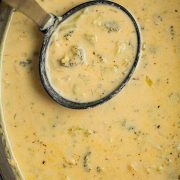 I just stocked up on more cheddar, because this easy broccoli cheese soup is a regular at my house when it starts to get cold. I like it better than what I’ve had at any cafe and I love that it’s made with real ingredients — none of that weird processed cheese in this recipe! You’ll love it so much you might even want to double up the recipe so you can have some left for lunch the next day. Trust me, you don’t want to miss out on this recipe! It doesn’t require much, but the end result is simply dreamy. It’s likely to become a new staple for you. I mean, who could resist? 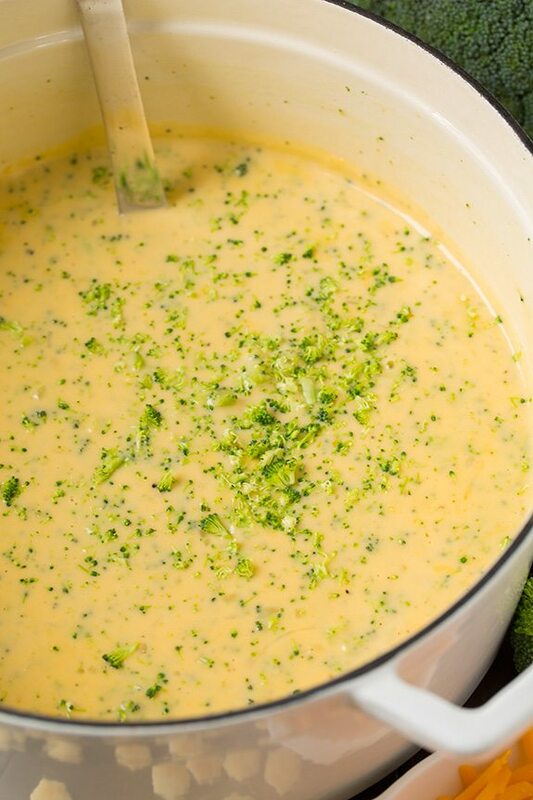 This cheesy broccoli soup uses just a handful of ingredients, but they’re all the right ones. Melt butter then saute onions, garlic and flour. Whisk in milk and broth. Add in the broccoli then cook and stir that mixture until it’s thickened and the broccoli is tender. Now just add the cream and cheeses, and you’ve got a soup you’ll instantly fall in love with! What’s the Best Milk for This Soup? I recommend using a dairy milk — anything but skim milk will work! The reason you don’t want to use skim is because it’s too thin and not flavorful enough. Because of the milk and cheese in this soup, I wouldn’t recommend freezing it. It’s best enjoyed within a few days of making it — trust me, it’ll disappear quickly! 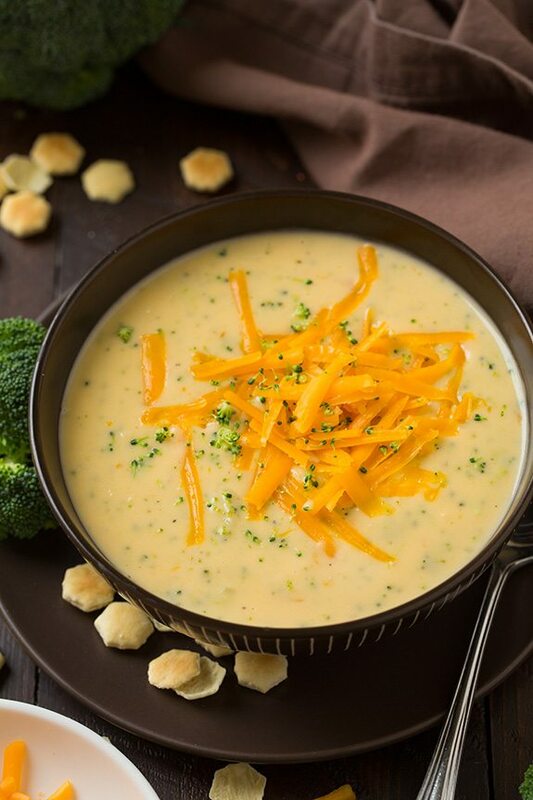 For an easy side to go with this cheesy broccoli soup, opt for some Baked Potatoes, or 1-Hour Homemade Bread, or a side salad. This soup would also be great in a Homemade Bread Bowl, and it’d taste just like you’d made a copycat Panera Broccoli Cheese Soup! 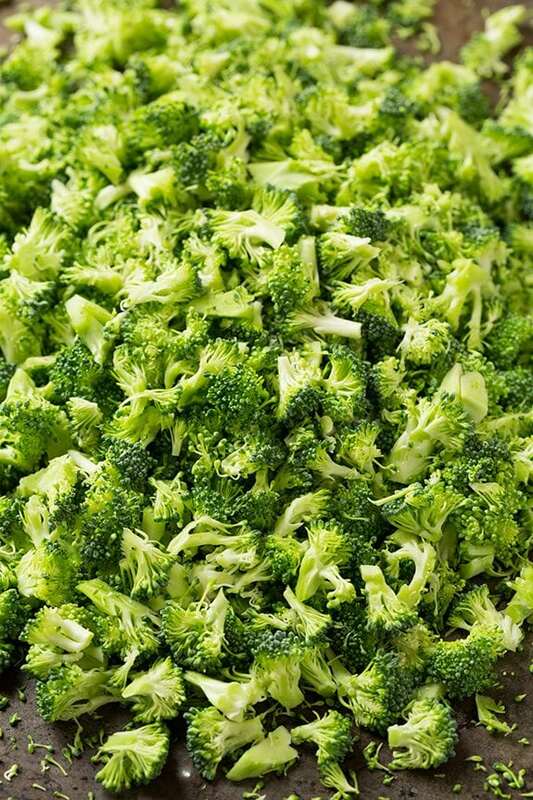 Cut broccoli into tiny pieces, that way they cook faster and the texture is just better overall. Be sure to dice up the onions very small or they won’t cook through fast enough. No one wants crunchy onions in this soup. 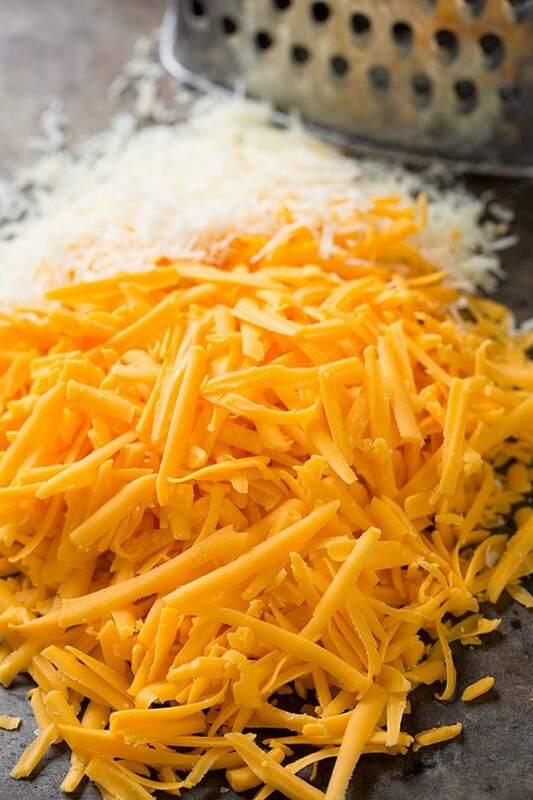 Don’t use pre-shredded cheese or the soup may end up grainy, plus the flavor won’t be as good. Start with a block and grate if fresh. 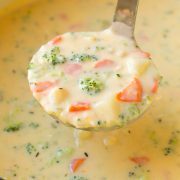 This is my favorite Broccoli Cheese Soup! The best texture, the best flavor, a perfect consistency and lot so broccoli cheese flavor. This soup does not disappoint! Add in onions and cook, stirring frequently until soft, about 3 minutes. Add in garlic and flour, and cook for about 1 minute, stirring constantly. While whisking, slowly pour in milk, chicken broth and broccoli. Cook, stirring constantly until mixture begins to gently boil and thicken, then reduce heat to a simmer and allow to cook, stirring very frequently, until broccoli is tender, about 5 - 7 minutes. Stir in cream. Remove from heat, stir in cheddar and parmesan cheese, mixing until melted. Season with salt and pepper to taste. 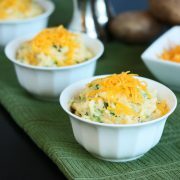 Serve warm with more cheddar if desired. *From about 2 heads of broccoli, use floret portion only. I began with about 1 lb broccoli crowns, chopped off majority of the stems, then chopped the florets into very small pieces about 1/4 - 1/2 inch.